Vehicle signwriting is one of the most cost effective ways to advertise your business, some of the most effective designs can just be lettering in one or two colours. Just Print use a 5 year outdoor grade vinyl to make stunning designs that will last the test of time. To give your business that professional look when your out on the road. For more complex pictures, logos and full colour images we use a process of digital printing. Our wide format digital printer prints solvent ink onto self adhesive vinyl. For vehicles we normally over-laminate the print with a clear vinyl to give added protection against abrasion. We can even print images onto rear windows using a material which allows the driver to see out, but prevents anyone seeing in. Once printed we can contour cut the graphics to any shape. This process is also used for stickers and labels. Some vehicles liveries adopt both processes with both computer cut vinyl and digitally printed graphics. Another popular method of signing vehicles is with the use of magnetic signs. These can be removed and refitted quickly and easily as required. Magnetic signs are made from 1mm thick magnetic rubber sheet. We can make magnetic signs to any size, up to 600mm high. They can be any length, but above 1.5m x 600mm they may become a bit difficult to handle. 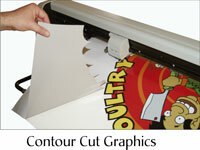 Vinyl graphics or digital prints are applied to the magnetic sheet. Magnetic signs should be fitted to flat areas such as doors and side panels. They should be made to such a size that they fit nicely in the area and do not go over trim, sharp contours and panel edges. 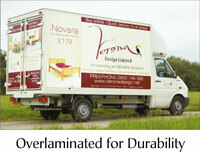 Therefore - Whatever your company style and logo we will be able to produce stunning vehicle graphics.